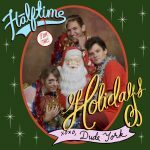 Do you remember Dude York‘s Halftime For The Holidays, which we delivered last year with a big helping of Christmas cheer? Stereogum said, “It’s a mix of pumped-up originals that act as sardonic takes on classic holiday songs, and it’s a whole lot of fun.” The good news about Christmas albums is that they can be pulled out year-after-year, and we’re excited to see that several stations are spinning the LP again. You can spin it too! If you missed it, be sure to get Halftime For The Holidays on our download page.